The world's earliest record of rock art was made in China more than 1400 years ago by a geographer of the Northern Wei dynasty (386-534 AD) named Li Daoyuan. He recorded in his book Shui Jing Zhu - 'Notes on the System of Rivers' - that there were many painted cliffs in the Yinashan area of the Great Bend of the Yellow River in Inner Mongolia. 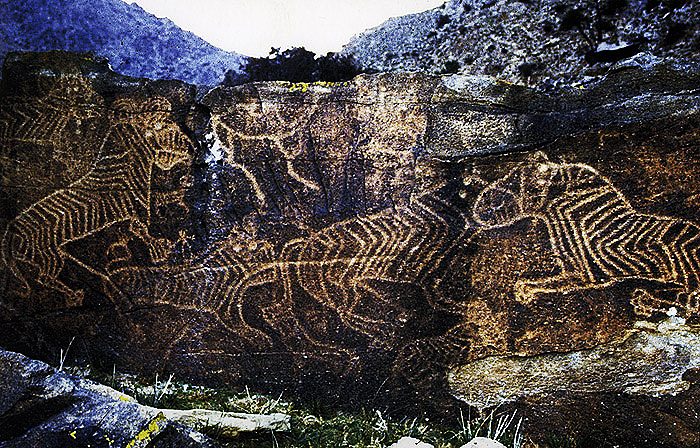 Today it is the petroglyphs that have survived over time. But perhaps the most spectacular rock art site with 'many painted cliffs' is found to the south in the Guangxi Zhuang Autonomous Region, neighbouring with Vietnam. Huashan, formerly known today as the Zuojiang Huashan Rock Art Cultural Landscape, may be considered to be one of the most impressive pre-Historic painted panels. With over 1800 painted rock art motifs, covering an area of more than 4,000 square metres, it is thought to be the largest rock art panel in the world. 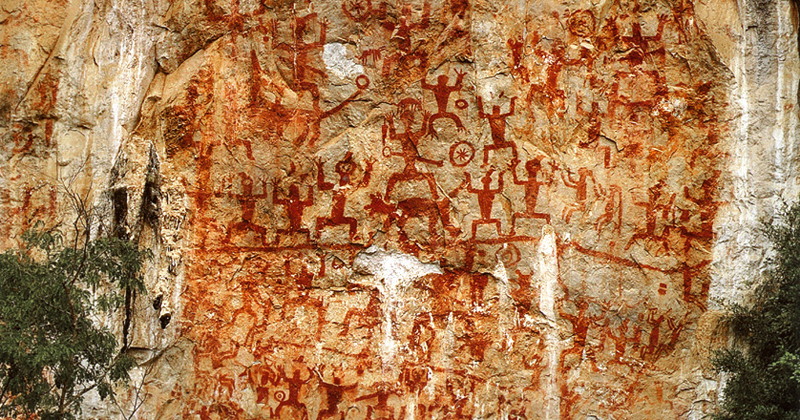 There are 38 rock art sites in the Zuojiang Huashan Rock Art Cultural Landscape. Huashan is called 'Pay Laiz' in the local Zhuang language, which literally means 'a mountain with colourful paintings'. The paintings of the Huashan rock art site are highly standardised. All the images are monochrome, painted in a brownish-red colour, and represented in two dimensions without a sense of perspective or depth of field. Only a few motif types are depicted; these are mainly anthropomorphs, zoomorphs and figures supposedly depicting implements, such as swords, daggers, drums and bells. More than 85% of the motifs are anthropomorphous. These figures are represented either in frontal view or in profile, all with the same posture: arms stretched up at the elbow and legs semi-squatting. With a strong sense of uniformity, the typical composition of the images is one of a large frontal view of a distinctly human figure that dominates the centre, mostly with a sword hanging at the waist or held in hand, a dog under the feet, and a bronze drum-like object nearby, surrounded by lines of smaller profile human figures without weapons. The Zuojiang Huashan Rock Art Cultural Landscape is exactly that; a 'landscape' of prehistoric rock art within the widely distributed karst landforms which the Zuojiang River and its branch meander through, for over 100 kilometres. Whilst the Huashan Rock Art Site is the most spectacular, the fact that there are 38 designated sites for the prehistoric paintings demonstrates the uniqueness and scale of the Zuojiang Huashan Rock Art Cultural Landscape. The environment is integral to the paintings; mountains, river and terraces. The rock art sites are almost all located on the bend of the river and opposite flat cultivated terraces, occupying consistent painting sites in terms of height and cliff position. Most paintings face south or west. The surrounding archaeology, with evidence from the Palaeolithic to the Neolithic, is consistent with the distribution of the rock art paintings. Clearly, the effort people made to paint the magnificent images by taking high risks climbing the precipitous cliffs cannot have been driven by mundane needs. The relative inaccessibility created by the karst landforms of the Zuojiang River area has left the Zuojiang Huashan rock art well preserved and undamaged for the last 2,000 years since the Eastern Han Dynasty. The current documentation and preservation of the rock art of Huashan will ensure that such efforts of the past will survive into the future. Huashan is currently being presented to UNESCO for World Heritage Site status.